A new study shows a thick organic haze that enshrouded early Earth several billion years ago may have been similar to the haze now hovering above Saturn's largest moon, Titan, and would have protected primordial life on the planet from the damaging effects of ultraviolet radiation. The University of Colorado at Boulder scientists believe the haze was made up primarily of methane and nitrogen chemical byproducts created by reactions with light, said CU-Boulder doctoral student Eric Wolf, lead study author. Not only would the haze have shielded early Earth from UV light, it would have allowed gases like ammonia to build up, causing greenhouse warming and perhaps helped to prevent the planet from freezing over. The researchers determined the haze of hydrocarbon aerosols was probably made up of fluffy, microscopic particles shaped somewhat like cottonwood tree seeds that would have blocked UV but allowed visible light through to Earth's surface, Wolf said. Prior to the new study, the prevailing scientific view was that the atmosphere of Earth some 3 billion years ago was primarily made up of nitrogen gas with lesser amounts of carbon dioxide, methane, hydrogen and water vapor, said Wolf. "Since climate models show early Earth could not have been warmed by atmospheric carbon dioxide alone because of its low levels, other greenhouse gases must have been involved. We think the most logical explanation is methane, which may have been pumped into the atmosphere by early life that was metabolizing it." A paper on the subject by Wolf and CU-Boulder Professor Brian Toon of the atmospheric and oceanic sciences department is being published in the June 4 issue of Science. NASA's Planetary Atmosphere Program funded the study. The output of the sun during the Archean period some 3.8 billion to 2.5 billion years ago is thought to have been 20 percent to 30 percent fainter than today, said Wolf. But previous work by other scientists produced geological and biological evidence that indicates Earth's surface temperatures were as warm or warmer than today. As part of the early Earth study, Wolf and Toon used a climate model from the National Center for Atmospheric Research and concepts from lab studies by another CU group led by chemistry and biochemistry Professor Margaret Tolbert that help explain the odd haze of Titan, the second largest moon in the solar system and the largest moon of Saturn. 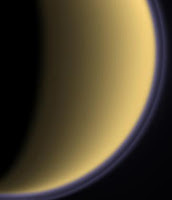 Titan came under intense study following the arrival of the Cassini spacecraft at Saturn in 2004, allowing scientists to determine it was the only moon in the solar system with both a dense atmosphere and liquid on its surface. Previous modeling efforts of early Earth haze by other scientists assumed that aerosol particulates making up the haze were spherical, said Wolf. But the spherical shape does not adequately account for the optical properties of the haze that blanketed the planet. Lab simulations helped researchers conclude that the Earth haze likely was made up of irregular "chains" of aggregate particles with greater geometrical sizes than spheres, similar to the shape of aerosols believed to populate Titan's thick atmosphere. Wolf said the aggregate aerosol particulates are believed to be fragmented geometric shapes known as fractals that can be split into parts. During the Archean period there was no ozone layer in Earth's atmosphere to protect life on the planet, said Wolf. "The UV shielding methane haze over early Earth we are suggesting not only would have protected Earth's surface, it would have protected the atmospheric gases below it -- including the powerful greenhouse gas, ammonia -- that would have played a significant role in keeping the early Earth warm." CU-Boulder researchers estimated there were roughly 100 million tons of haze produced annually in the atmosphere of early Earth during the Archean. "If this was the case, an early Earth atmosphere literally would have been dripping organic material into the oceans, providing manna from heaven for the earliest life to sustain itself," Toon said. "Methane is the key to make this climate model run, so one of our goals now is to pin down where and how it originated," said Toon. If Earth's earliest organisms didn't produce the methane, it may have been generated by the release of gasses during volcanic eruptions either before or after life first arose -- a hypothesis that will requires further study, he said. The new CU-Boulder study will likely re-ignite interest in a controversial experiment by scientists Stanley Miller and Harold Urey in the 1950s in which methane, ammonia, nitrogen and water were combined in a test tube. After Miller and Urey ran an electrical current through the mixture to simulate the effects of lightning or powerful UV radiation, the result was the creation of a small pool of amino acids -- the building blocks of life. Toon said the theory of early Earth being shrouded by a gaseous blanket containing methane and ammonia first arose in the 1960s and was subsequently discarded by scientists. In the 1970s and 1980s some scientists suggested the early Earth atmosphere was similar to those on Mars and Venus with lots of carbon dioxide, another theory that eventually went by the wayside. Since CO2-rich atmospheres do not produce organic molecules easily, scientists began looking in deep-sea volcanic vents and at wayward asteroids to explain early Earth life. A 1997 paper by the late Carl Sagan of Cornell University and Christopher Chyba, then at the University of Arizona, proposed that an organic aerosol shield in early Earth's atmosphere would have protected the ammonia wafting beneath it, allowing heating to occur at Earth's surface. But the authors proposed the haze particles were spherical rather than irregular aggregate particles Wolf and Toon suggest and did not consider methane to be the driver of the system, eventually sinking that theory. "We still have a lot of research to do in order to refine our new view of early Earth," said Wolf. "But we think this paper solves a number of problems associated with the haze that existed over early Earth and likely played a role in triggering or at least supporting the earliest life on the planet." From space, early Earth probably looked much like Titan looks today, said Toon. "It would have been shrouded by a reddish haze that would have been difficult to see through, and the ocean probably was a greenish color caused by dissolved iron in the oceans. It wasn't a blue planet by any means."